If you love your craft as much as Richard does, only something good can come of it. It is sometimes hard to imagine Richard in anything other than chef’s whites! Before opening his own restaurant with Sybille, Richard had over three decades of experience winning numerous awards along the way. His success is borne out by the greatest accolade of all: the number of regular returning guests. 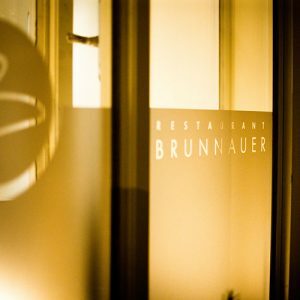 Sybille is the heart and soul of Restaurant Brunnauer, complementing Richard’s culinary skills with her flair for design, good management, and love and care for her staff and clientele. She takes great pride in meeting and greeting guests old and new and ensuring that all feel welcome and relaxed in what is in essence an extension of their family home. The core of our team has been together for many years and we value little things such as a staff coffee on our terrace before the arrival of our guests, and perhaps something a little stronger at the end of the day! Teamwork is everything and is a major part of our success. All of us have a passion for what we do and it encourages us when this is enjoyed and appreciated by our guests.